A New Hampshire man is making waves with his award-winning surfboard, which he constructed from hundreds of Dunkin' coffee cups. A New Hampshire man is making waves with his surfboard, made entirely from Dunkin' coffee cups. Thirty-two-year-old Korey Nolan of Hampton Falls is proud of his award-winning creation. "This is my Dunkin Donuts Styrofoam coffee cup surfboard," he said, showing off his board. Nearly 1,000 Dunkin' foam cups were used in the process. He documented the creation on Instagram. "You can't turn a corner in New England without hitting one," he said. "I picked them up on my own, on the street the trash." The creation is part of an international contest out of California to make something for surfing out of garbage. He first created a mold to press the coffee cups into thick sheets, used plant-based epoxy to glue them together, and finished with fiberglass. The fins are also made of plastic straws. "I did have a few people who reached out, told me it wasn't going to work," Nolan said. 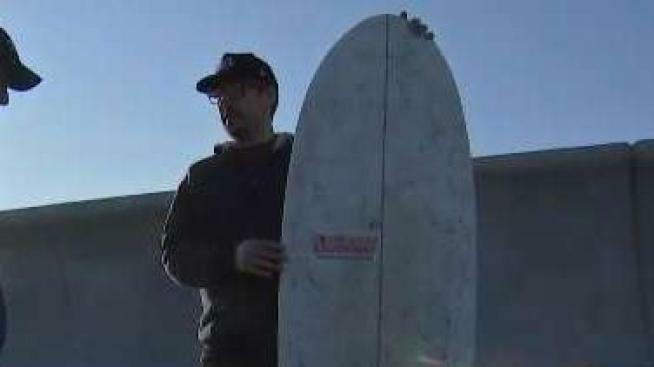 "It weighs about 15 pounds, so it weighs a little bit more than you'd expect a board this size to be, but once you get in the water, it floats you really well." Dunkin' has taken note and commented on social media, "This is awesome." Nolan hopes it brings awareness to the foam waste. "I just hope it spreads a message to think of the things you use on a day-to-day basis, and where it goes," he said. He plans to enter the contest again this summer with an even better idea, he said. But for now, he's keeping that under wraps.